I could go on about New Year, New You, healthy eating, lose weight January etc etc but at the end of the day, this dish is too delicious, and too versatile to just be categorised into one little part of the year. Of course, however, January does nothing well if not make us reassess our waistline, December choices and gym memberships so all that is going to be lingering somewhere at the back of most of our minds. 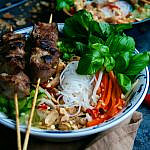 This gorgeous Vietnamese salad is a wonderful way to eat something that tastes awesome, is seriously easy to prepare and ticks your healthy eating boxes. 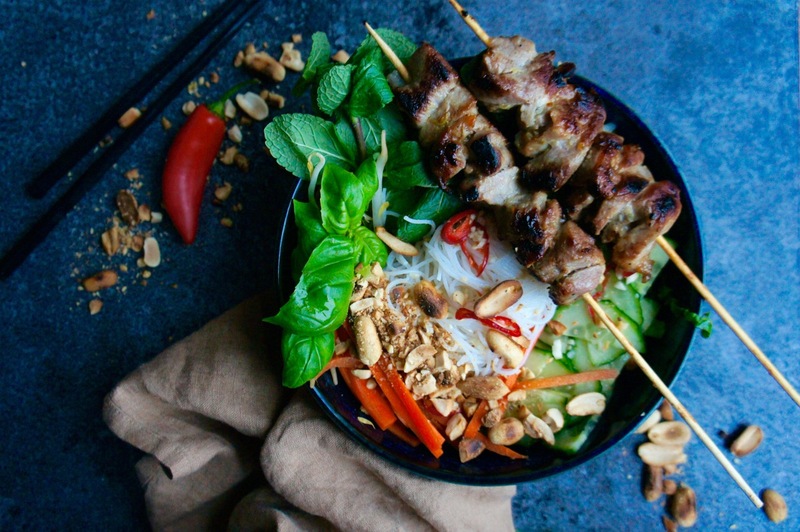 Bun thit nuong is a noodle salad comprised of vermicelli rice noodles, charred pork skewers, cucumber, herbs and a Vietnamese dipping sauce [nuoc mam cham] the salad is then topped with toasted peanuts and crispy onions. Traditionally it would have some spring rolls on there too but that makes it a little less accessible for me so I’ve gone for the easier version. 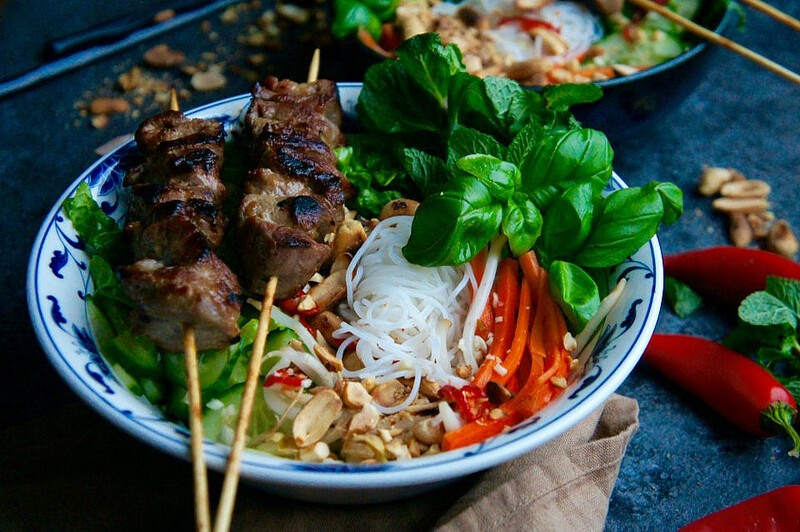 I’ve taken much inspiration for this recipe from Luke Nguyen’s amazing book, The Food of Vietnam, including his nuoc mam cham recipe and the pork marinade from his recipe for chargrilled pork neck. 1. Put the fish sauce, sugar and vinegar in a small saucepan with 60ml water. Place over a medium heat, stir well and cook until just before it boils. Remove the pan from the heat and allow to cool. Just before the salad is ready, stir in the garlic, sliced chilli and lime juice. Store in a tightly sealed jar in the fridge for up to 5 days. 1. MARINATE: In a large bowl, mix the sugar, fish sauce, honey and pepper together until the sugar has dissolved. Then add the bashed spring onion, garlic and pork slices. Mix it all together to coat the pork, then pour the vegetable oil on top. cover with cling film and marinate in the fridge for 2 hours, or overnight if possible – the longer the better! 2. 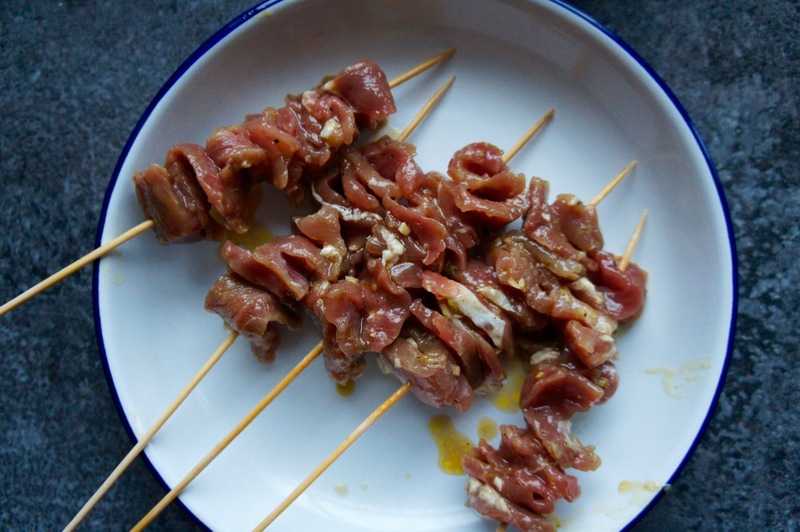 SKEWERS: When you’re ready to start preparing your salad, soak your wooden skewers in water for 15 minutes to prevent scorching, then thread the pork onto the skewers and get rid of the remaining marinade. 3. NOODLES: Cook your noodles – pour boiling water over the noodles in a large saucepan (off the heat) and leave to soak for 4-5 minutes until soft. 4. PORK: Char grill (if you can) or fry the skewers over medium – high heat for 1-2 minutes on each side, rotating until just cooked through and nicely browned/charred on each side. 5. NOODLE BOWLS: To serve, divide the noodles between 4 bowls. 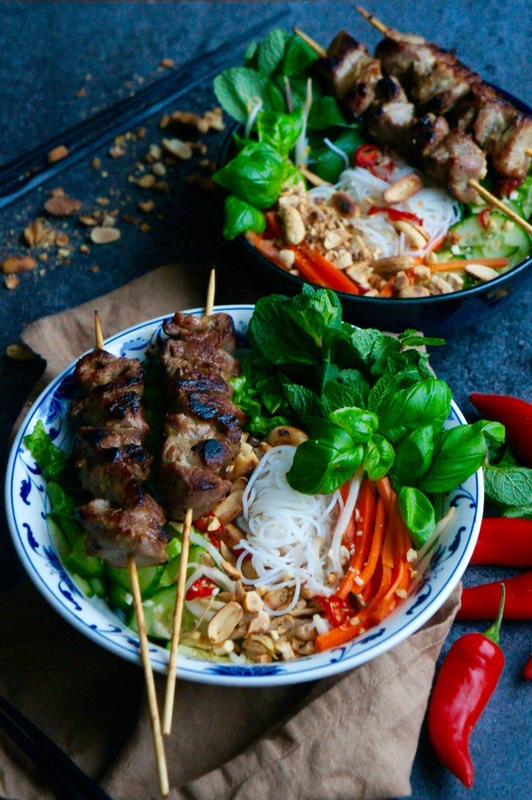 Top with the herbs (whole leaves, or shredded if you prefer), cucumber slices, pickled carrot and beansprouts, then sit the pork skewers on top. 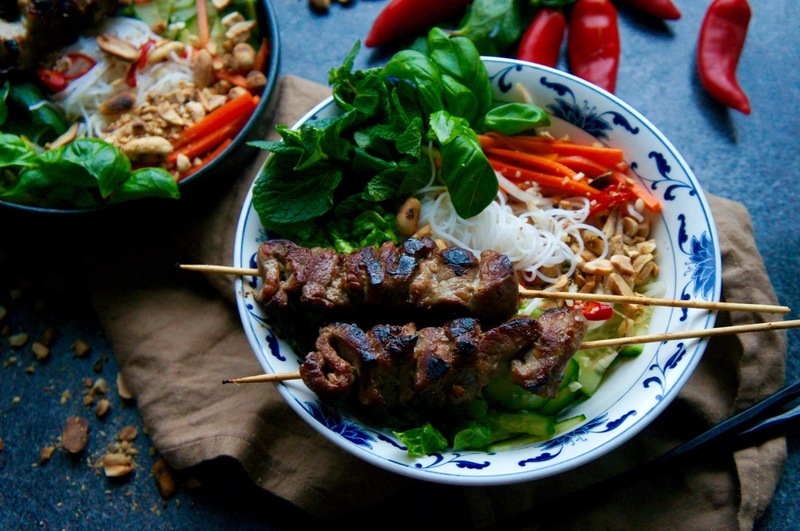 Drizzle each bowl with the nuoc mam cham dipping sauce and sprinkle on the crispy shallots, crushed peanuts and spring onion slices.